Our in-house lab has skilled technicians who are renowned for creating beautiful, lifelike restorations. 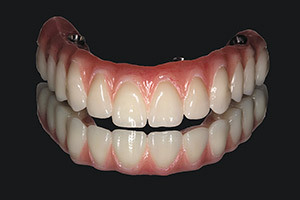 Our dental restorations are lifelike, durable and aesthetic. Our dental lab, Glendale Implant & Esthetic (GIE), is located right in the same building as our practice. We have 10 highly trained lab technicians and offer the highest quality restorations with very fast turnaround times. Having a dental lab on the premises allows our doctors to ensure your dental restoration looks natural and aesthetic and fits perfectly. The lab makes treatment faster, allowing patients to walk out with great-looking, functional provisional teeth in one day, and it makes same-day teeth procedures possible. It also allows for more accurate results as there is no chance of alteration of the composition of the restorations during transportation. Dr. Aboolian coordinates between our dental office and our dental lab. Our lab is run by Allen Meserkhani, brother of Dr. Meserkhani, who is a Certified Dental Technician with over 30 years of experience. Many of the working technicians have over twenty years experience. They combine modern dental technology with artful craftsmanship to create lifelike, well-fitting and functional restorations. 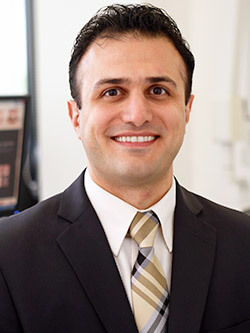 Dr. Arbi Aboolian coordinates between the dental office and the dental lab and specializes in lab-related procedures such as dental implants and teeth restoration. As well as being an accomplished general dentist, Dr. Aboolian has special training in dental laboratory techniques. He is a Certified Dental Technician and has worked in dental laboratories that focused on implant-supported teeth for 11 years. His work makes for a smooth coordination between our doctors and our lab, resulting in the highest quality in tooth restorations. Our lab technicians work with our doctors to create your restoration following the doctor’s exact instructions. Having a lab on the premises also means patients can communicate directly with the lab technicians about the color, shade and shape of their new teeth. Since the lab is right on the premises, any adjustments to the restorations can be made quickly and easily. match the shade of your new restoration to your other teeth.